Duncan is a well-documented and SEO friendly Lawyer WordPress Theme, produced for law websites. Provide your customers with all the details about your services with Cherry Projects portfolio and showcase your law experts and people's minds about your business for making your lawyer office website far more reliable. Capture your clients by presenting the philosophy of your law bureau with an elegant Website Slider. Multiple blog layouts and versatile header & footer styles allow you to edit your theme with your own style, while WordPress Live Customizer provides you with an enjoyable and easy process of your attorney site's customization. Forget about complex website building with Power page builder that allows you create professional pages on the fly. 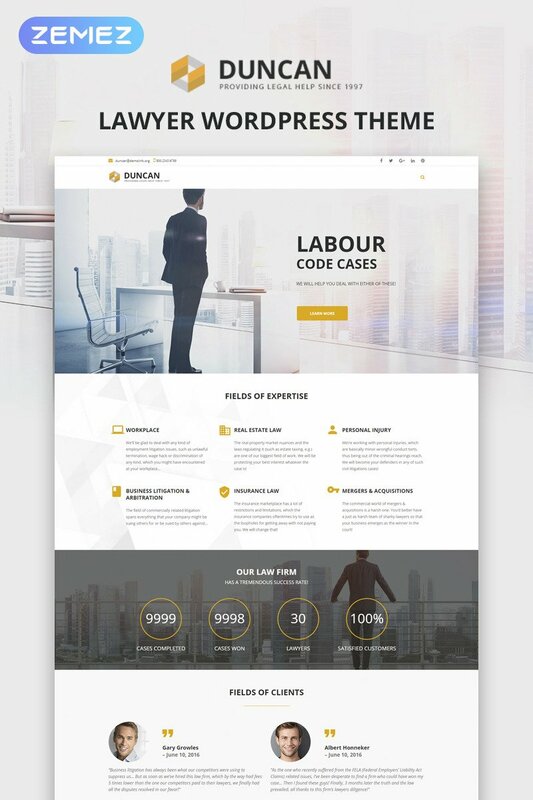 Enjoy your stunning website with this lawyer firm theme! You don't have to be a professional at SEO to get high positions in Google. WordPress SEO plugins help to compose SEO-ready titles and meta descriptions, and in addition analyze on-page content, enable you to make XML-sitemaps, and much more. Way more tools - a lot more options available. Cherry Framework gives the end user a significant set of tools that will effectively increase standard WordPress usefulness. It can make the whole process of site creating far more convenient for beginners as well as faster for skilled website designers. Responsive design means that the web page adjusts its shape and size in order to suit almost any display screen, from the tiniest phones to the largest PC monitors. For every single gadget, web page elements grow or lessen to look ideal. Cellular phones drive 80percent of worldwide cyberspace usage. It's crucial to make the web presence responsive in the event you do not wish to drop your current target audience. GPL or General Public License is a certificate for free of charge software under which the author transfers the software into open ownership. Because of certification under the terms of the GPL, the author supports the authorship. GPL License allows users the freedom to study, renovate and distribute software without any limits. Sample data installer is a module which allows to setup and add a sample info for a web design easily. Sample Data Installer allows you to set up a layout easily and inspect how your site will look like before it's done properly. It doesn't matter whether or not you already have clientele talking a different foreign language, or maybe just want to broaden your business overseas - WPML plugin can help you with this. It is works with the vast majority of current website page builders and also CMS. To make sure you don't really need to be concerned about that. Retina Ready design templates are the most effective way to display your high-resolution photos on screens with any sort of pixel-density. Retina Ready layouts make all photographs and content appear clearer, brighter, and more vivid. What am I allowed and not allowed to do with the WordPress designs for Society & People Support? You may: Build a website using the WordPress template for Business Bureau in any way you like.You may not:Resell or redistribute templates (like we do).Claim intellectual or exclusive ownership to any of our products, modified or unmodified. All products are property of content providing companies and individuals.Make more than one project using the same template (you have to purchase the same template once more in order to make another project with the same design). Can I resell the Small Business WordPress themes I bought the extended license for? No, you cannot resell the Small Business WordPress themes as is. You can only sell them as the integral part of your new product. No. According to our Terms and Conditions we never sell the images separately from Business Bureau WordPress designs (as well as the templates separately from the images). What is Developers License for Law Adviser WP template? If you purchase a Developer's license, you are granted a non-exclusive permission to use the Law Adviser WP template on up to 5 domains for projects belonging to either you or your client. Is it possible to use your WP templates for Attorney Services to develop websites for my customers? Yes. It is perfect for designers who want to offer their customers a high-quality design and also save time and money. Keep in mind that when you purchase the WordPress theme for Society & People Support with ordinary or exclusive license you're entitled to create only one project (one domain name). Can I resell the WordPress theme for Lawyer Firm as is? No, you cannot resell the WordPress theme for Lawyer Firm as is. What is GNU GPL v3.0 license and can I use it with WP template for Law Journal ? If you buy a WP template for Law Journal released under GNU General Public License v3.0, you can use it on any number of projects belonging to either you or your clients without any limitations. This license allows you to modify the template and its sources to suit your needs. Can I use graphics from WordPress design theme for Lawyer Blog I purchased for use in printing? Yes, it's not prohibited to use the WordPress design theme for Lawyer Blog graphics for printed material, but the resolution of the templates graphics ( except for logo templates) is not enough for printing. Will TemplateMonster help me to edit my WordPress design for Lawyer? TemplateMonster offers you a variety of sources to help you with your WordPress design for Lawyer. Use our comprehensive Online Help Center to get the basic knowledge about your WordPress design for Lawyer. Our Knowledgebase contains customers questions and most frequent problems. Anyway, you can always use TemplateMonster 24/7 phone support, try our Ticket System or Live Support Chat to get qualified assistance from our support representatives. What do I receive when I order a WordPress theme for Society & People News from TemplateMonster.com? After you complete the payment via our secure form you will receive the instructions for downloading the WordPress theme for Society & People News. The source files in the download package can vary based on the type of the product you have purchased.If you need unzipping software to open the .zip archive, Windows users may visit www.WinZip.com, Mac users may visit www.StuffIt.com. How can I modify WP template for Law Blog to suit my particular website? Please visit our Online Help Center to obtain detailed instructions on editing WP template for Law Blog . What is a unique purchase license for WordPress template for Business Bureau ? If you purchase the product at a ‘Unique price' it guarantees that you are the first and the last person to buy this WordPress template for Business Bureau from us. It means that this template has not been sold before and you become an owner of a unique design. After this kind of purchase the template is being permanently removed from our sales directory and is never available to other customers again. The unique purchase license allows you to develop the unlimited number of projects based on this template, but the template should be customized differently for every project. Are your Solicitor WordPress themescompatible with any CMS? Can I get the WP template for Law Blog in higher resolution to use for printing? 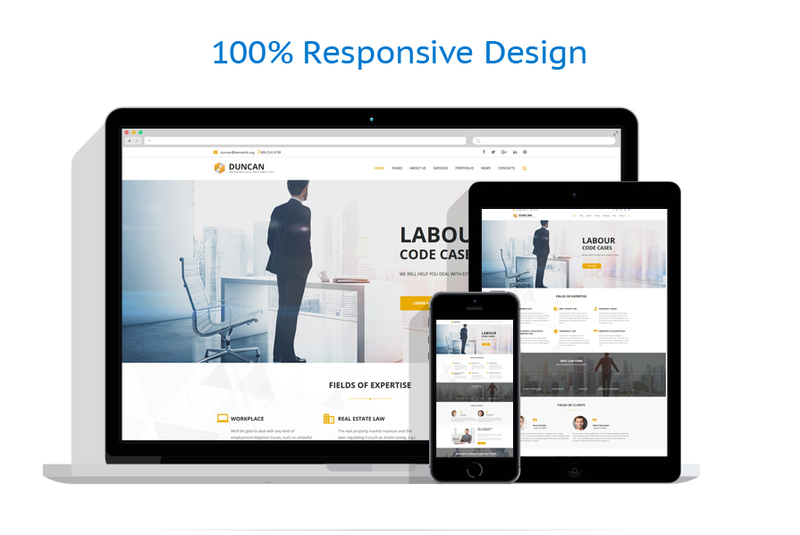 No, we design WordPress design themes for Lawyer Firm optimized for web resolution only. In what cases I don't need the extended license for WP themes for Lawyer Services? Can I customize the WordPress design theme for Law Firm if that's required by application settings? Yes, you can customize the WordPress design theme for Law Firm code, graphics, fonts to any extent needed. Are images included in the WordPress templates for Society & People Services released under GPLv3.0 license? In the WordPress templates for Society & People Services released under GNU GPL v3.0 images are not included and are used for demo purposes only. Can I resell the customized WordPress design for Business Journal ? Yes, you can redistribute WordPress design for Business Journal under the terms of the GPL as well. Can I contact the WordPress theme for Society & People News author? Yes. You can contact this WordPress theme for Society & People News author/author's team directly using your personal account under the Support tab. Is it reasonable to make unique purchase of WordPress design theme for Lawyer Association that was already purchased before? Yes, it's reasonable to make a unique purchase of WordPress design theme for Lawyer Association. Because there is very small chance that you will find the same design on the net. There are more than 3,000,000,000 webpages online now according to statistics on www.google.com. Can I put a line at the bottom (or any other spot) of my new product "Website development by Company name" after purchasing WP theme for Business? Yes, you can place a note at the bottom (or any other spot) of my product "Website development by Company name". Nevertheless, you cannot place "Website design by Company name"while using one of WP theme for Business. How many applications, programs etc can I use to integrate with the Lawyer Association WP themes under one extended license? The extended license gives you the right to use the purchased Lawyer Association WP themes for the integration with one software/freeware/application/CMS/sitebuilder only. In case you would like to use the template with the other application, the other license is to be acquired. Is it possible that Template Monster will contact my client which website I made from Template Monster's website Society & People Support WP theme? Yes, our legal department checks licenses regularly. In case we won't find designer's contact information on the site which was made from the Society & People Support WP theme of ours we will contact the owner of the site directly. I would like to purchase WP template for Attorney Services, but it is not available on the site anymore. The WP template for Attorney Services has been sold out for exclusive price or discontinued.As technology inevitably develops, TemplateMonster may discontinue the production of certain products. It can be no longer available for sale because of being outdated. Will the Corporate WP template be deleted from TemplateMonster database? No, the Corporate WP template will not be deleted from TemplateMonster database. What is the price for acquiring the extended license for WordPress theme for Law Office? There is no set price for acquiring the extended license. The price is based on the WordPress theme for Law Office's unique price for those templates you would like to use for the integration. The price for purchasing license for a single template is half of the template unique price. What are the advantages of purchasing a Attorney Services WordPress design? The major advantage of purchasing a Attorney Services WordPress design is price: You get a high quality design for just $20-$70. You don't have to hire a web designer or web design studio. Second advantage is time frame: It usually takes 5-15 days for a good designer to produce a web page of such quality. Please email to [email protected] with your inquiries about WP templates for Society & People News. Will you help me to customize my WordPress design for Lawyer? We do not provide any help or instructions on WordPress design for Lawyer customization except for www.template-help.com help center. If you are not sure you can customize the template yourself we recommend to hire a design studio to customize the template for you.